Hello, my name is Kane Peterson and I want to spend a few minutes showing you how to use Web Captioner and TriCaster together. 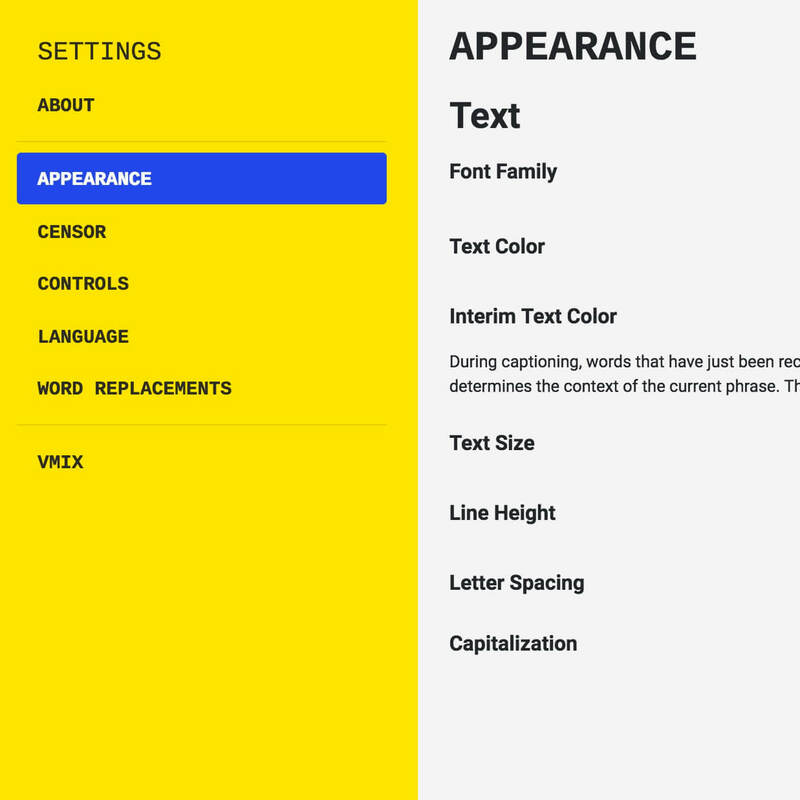 Web Captioner is a program that it’s actually runs on a web browser that I’ve told a few people about and it’s pretty cool but often the next question I get after I tell people about it is, well, how do you make this all work? 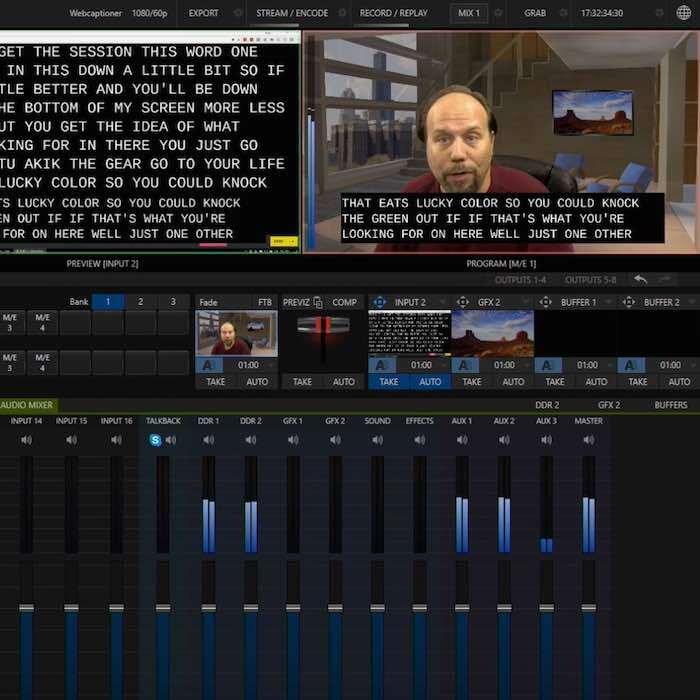 How do you get TriCaster and it working together? So that’s what I want to spend here is just kind of show so that other people can see how to do this and follow along hopefully. What you need to make it to work the way I’m gonna show here — and I’m not saying this is the only way to make it work — but I’m going for the 100% NDI workflow. 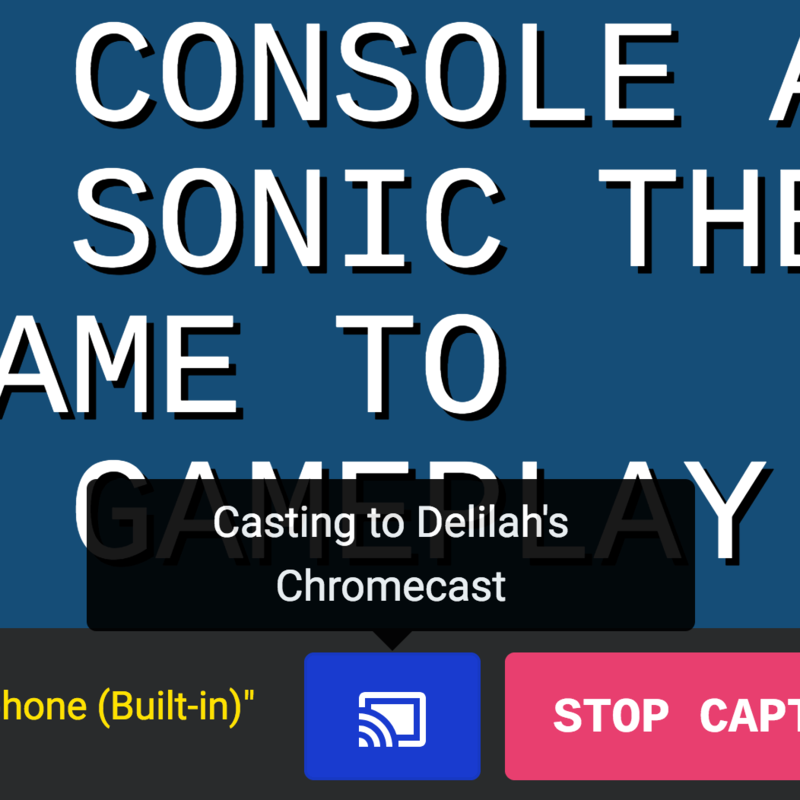 So I am going to take the output of my TriCaster, feed it via NDI into Web Captioner, and then take the Web Captioner output via NDI back into the TriCaster. So that’s that’s what we’re going for here. So besides the TriCaster, you need a computer that’s gonna run the Web Captioner software. You also need NDI tools which you’ll install on the Web Captioner software system. And then there’s one additional piece of software you need called NDI Transmit. This one is not free. It is not terribly expensive, so if you want to go this route you will need that. You’ll install that as well on the Web Captioner system, and once you have all those pieces we’re kind of ready to get started. And by the way there is a demo version of NDI Transmit you can download, so I would suggest downloading the demo version, trying that out, making sure this all works to your needs before you go buy anything. And then if it is, you can buy the NDI Transmit and you’re ready to go. Okay, so first thing is let’s get Web Captioner into the TriCaster. So we’re gonna jump over to my Web Captioner system. Now I already have the Web Captioner webpage up which is webcaptioner.com. But I want to share this out so I’ve already started the NDI scan converter software, which once you’ve run it, appears down in the corner by your clock. It’s a little kind of orangey NDI icon. And you right-click on it and in the window that pops up will show you all the things you can share out. In our case, we just want to share the entire screen that my Chrome browser is running on it. But you have to be running Chrome by the way if you’re not aware of that because that is required for Web Captioner to operate. So that’s running on my Desktop  — so I’m sharing that. And so now that that’s being shared, I’m gonna go back to my TriCaster and I’m gonna bring that in under input two on my system. So here’s input two — it’s empty right now. So I’m gonna click the gear under it, go to my input settings, and where it says “Source”, go in there and find my my laptop which happens to be right here. And there’s “Desktop 1” — I’m gonna select it. And there you go. Now I happen to have desktop — that desktop of the computer showing up inside my TriCaster. Now the next thing I need to do is I need to get my the correct audio out of my TriCaster into the Web Captioner software. And so if you take a look at my audio mixer I’m gonna be using a TriCaster audio mixer to do this. You’ll notice I’ve got my audio from my microphone coming in on Input 1. I’ve got some other audio coming in — I’m just playing some stuff in my DDRs to show some background noise or maybe it’s music or audio I don’t want, effectively. And then if we go way over to the side here, you can see my four audio mixes coming out of my TriCaster. You’ll see that right now they’re all set to the same thing which is a mix of everything. So what I want to do is I want to get strictly my audio only on one of these outputs and not have any of the other sound in there as well. So that way I get a clean audio feed that has no music, no background audio, no sound effects or anything like that in there. It might be more than one person talking but strictly just the voice of them talking is what I want. So the way we can do this is we’re gonna choose one of our audio outputs. So we’ve got a master and three auxes. Pick any one of them. I’m gonna pick aux 3. I just kind of like to use the last one here. So aux 3 is going to be our chosen mix. What we want to do then is we want to go to any channel of audio that we do not want. I don’t want these two DDRs in the final mix. I’m going to go to those DDRs, I’m going to click the audio slider gear, and in the window that opens up, if you’re not on the routing tab, go to the routing tab. And there are your four audio mixes — go to aux 3 and hit clear. And then do the same thing for anything else. I’m going to do that for my DDR 2 and hit clear on there. So now I have removed that audio from aux 3. If we go and take a look now down there you can see that aux 3 doesn’t look the same as the other ones, right? Because it’s only the audio of my microphone that happens to be showing up in there. In fact I’ll be quiet for a second and you can see that it’ll be very low. There you go. Now there’s a little bit of noise in there — that’s the fans and stuff that happen to be next to me, but you can see that it does not have any of that other sound in there that’s normally playing. Now that we have our audio mix created, we need to send that audio mix out of the TriCaster so that we can pull it up in another application. To do that, we’re going to go to the gear under our program window, here. Click on that and in this window that appears, you’ll see my four audio mixes, mix 1 through 4. You can see what audio is assigned to those. So I’m gonna pick the last one in my case, mix 4. Again you can pick any one that you want, but we’ll use mix 4. Under audio, instead of it being master audio, I want to click on that and under my audios, I want to choose aux 3 because that’s the special audio channel I created that’s only got my audio in it. Now that fourth output of my TriCaster system has just my audio on it. If I actually plugged in an SDI cable to the fourth output, I would only hear my audio. In this case the NDI audio that’s also coming out the fourth output also only has my audio on it. So now the TriCaster is outputting what we need and we’re ready to go back over to Web Captioner and pull that into the system. So we’re back over in Web Captioner and now we need to tell NDI Transmit what we want it to pull in so that we’re getting the appropriate signal brought in from the TriCaster. So NDI Transmit, which I’ve already started up, and again you’re just going to run it, and when you do it’s going to appear as a icon down by your clock. In this case it is the the yellowish-style NDI icon you can see in there. Right-click on that and in this list (and my list is very long because I have a lot of sources out of my NDI network), you’re going to go find the output that you assigned that audio to on there. So in my case, my system is called VMC1. I put it on the fourth mix output if you remember in that window, and I already have it selected but I would just go in this list and click on the one that would be the appropriate selection in there. So now I’ve got the audio selected and here’s one last little tip that you might want to do as well. If you go back into NDI Transmit (normally it’s not scrolled off but I have so many inputs it is), just scroll down to the bottom where it says Audio, there are audio adjustments you can do. So this is that audio feed coming in. And I’ve just found that if I bump it up a little bit higher, and this might depend upon who is speaking and just audio levels and, you know, how audio set in the TriCaster for your production versus your stream versus what’s going over, here — but nonetheless the nice thing is is I can kind of adjust this as necessary. I found for me that bumping this up a little bit helps with getting the right audio level into Web Captioner so that it can pick up my voice really well. I’d be having a plus 12 but again you can play with that as necessary to get the appropriate levels you need. All right, so now we’re ready to start up Web Captioner and make it do what we want it to do. So I’m going to go into the Web Captioner I’m gonna hit Get Started. Down here it says “Start Captioning” — the first thing is I might want to configure it slightly. So I’ll click the arrow. And where it says appearance this is where I can adjust some of the settings. Do I want it on a green background or not, what do I want the font, all these settings you can go and play with this. But in my case I don’t want to key it right now, I just want to have this kind of on a black background. I think that’s gonna work better for my needs. So I’m gonna go in here and turn off the “make transparent”, but if we wanted to we could use the TriCaster keyer to knock that out as well. And so — whoops I forgot to accept that I think. Save, there we go. And so now I’m ready to start the software and get it using my audio. So you might not see this next icon you need until you click the start captioning button, so I’m going to click start captioning, and it says now listening but it doesn’t hear anything because I haven’t connected it to the right audio source yet. But now that I’ve started this you’ll see up at the top of my interface there is a little icon that looks like a camera. Click on that and in the window that pops up you can hit “Manage” and this will allow you to go in and configure the proper audio source that you want the Chrome web browser to use, which in turn is the audio source Web Captioner has access to. So right at the very top where it says default microphone, I’m going to click on that, and you want to choose the one called, Line (NewTek NDI AUdio). When you select that that is the audio output of NDI Transmit, which is then going to feed that audio in. So I’m going to select that and exit out here. And we’ll close it. If everything’s working, you can start to see audio appearing in Web Captioner. It’s reading the audio of what I’m saying. Obviously how accurate it is is all dependent how well you speak and levels and all that, so you might tweak this to you find some good levels for your needs. But now that we’ve got that, we can go back into the TriCaster. You’ll see the audio coming in on input 2 — I’m sorry, the text coming in on input 2. Now we want to overlay that on my output. so I’m going to use a downstream keyer to make that happen. So in my case, I’m gonna go — let me just reset this that’s all fresh — I’m gonna use one of my downstream keyers. I’m going to use downstream keyer one, the first one here. And you’re just going to click on the drop down, choose the appropriate input that you want. In my case I’m going to use input 2, which happens to be the input that the text is coming in on. And now I can turn it on. and when I do that, you can see that right now the downstream keyer is completely overlaying the entire screen. So I only want a portion of this text, maybe a couple of lines, and I want to position it. So we’ll go into our positioner tools and in here we can now go to edges. We’ll start by cropping this out. I’m going to crop the top down untill I get to about three lines of text. I’m going to crop the bottom to get rid of the other Chrome web browser stuff. I’m also just gonna crop just a tiny bit off the left and the right sides just in case there’s any edging of the Chrome web browser I just don’t want to see that. And then we can position this where we want. I want to zoom this down a little bit so it fits a little better, maybe move it down close to the bottom of my screen. Of course you could turn on safe title/safe action, on all that kind of stuff. I could crop it more or less depending upon if I want more lines of text or fewer lines of text. But you get the idea of what you’re looking for in there. If you were going to key it — if it had a green background, you would just go into input 2, click the gear, go to your LiveMatte, and you can select the key color so you could knock the green out, if that’s what you were looking for in there as well. Here’s one other little tip that you can also do. You can see the text on the screen. Maybe I’d like it to be a little bit transparent and this doesn’t appear to be an obvious thing you can do but it is possible. Select the the downstream keyers, click its image, make sure your transition is set as a dissolve, and then using this you can grab your t-bar and by moving that I can kind of set the amount of dissolve I want in there. So I’ll make it where it’s a little bit transparent but still enough that I can see it well. When you’re done just click back onto the main background delegate and then it will operate like it should. Now you can see I’ve got my text on the screen, it’s got a little bit of transparency so I can still see what’s happening underneath, but it’s still very readable at the same time. I now have open captions overlaid on my TriCaster output using NDI to get everything in and out of both of these systems. Thank you.